Masters Swimming is for swimmers who have reached the grand old age of 25 but still feel that they want to continue swimming for their own reasons. We have swimmers aged 25 to 55. We have novice swimmers to ex-international swimmers. It's not about being the best. It's not about competing all the time. Masters Swimming is about achieving what you want to achieve. Hinckley Masters do all this and many other things as well. Its all for fun! Sponsored Channel Swim 27th February 2000 A 12 hour swim to help raise funds for the Masters' chosen charity 'Rainbows Children's' Hospice', and helping the team to go to the World Championships in Munich later in the year. Lots of fun and helping a very worthwhile charity. 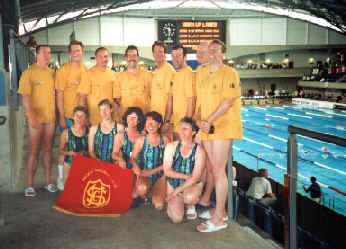 Midlands Masters, Leamington Spa 28th - 30th April 2000 Competitive but local. A great test. If you would like to find out more e-mail, or call in to the Club and meet the masters at 9.00pm Tuesday nights at Hinckley Leisure Centre.